If you have come to visit our city these days or you are just on vacation and want to take advantage of your free time, we give you some ideas to enjoy Easter in Madrid. 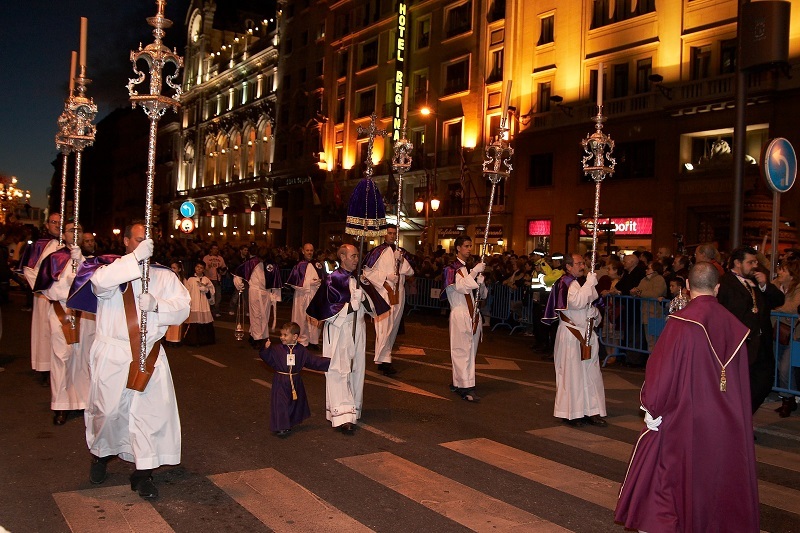 Various processions run through the center of Madrid. The best known are those of the Jesus del Gran Poder, which starts from the Collegiate Church of San Isidro on Holy Thursday, and that of the Christ of Medinaceli, which takes place on Friday from the Basilica of Jesus of Medinaceli. Another very popular, and that runs besides El Anciano Rey, is the Christ of the Alabarderos, also on Friday. It leaves from the Royal Palace and ends at the Castrense Cathedral, passing through the Plaza Mayor. In Easter there are several delicious sweets that can be tasted in Madrid. The most traditional are the torrijas and the fritters. And you do not have to look very hard because in El Anciano Rey we have incredible homemade torrijas. Although it is not a typical Madrid style, the habit of listening to flamenco saetas these days has spread throughout Spain. In Madrid this year there will be two sessions of saetas to listen on the street. They will be celebrated on Holy Thursday in front of the church of San Pedro el Viejo and on the side of the Collegiate Church of San Isidro. In addition to being an ideal date to visit some of the most significant religious temples in Madrid, some churches have scheduled sacred music concerts. The truth is that it is the best environment to listen to this type of music. Madrid can boast a very characteristic kitchen: calamari, cod, vigil stews, torrijas, buñuelos… you can not miss them in a visit to Madrid. And in El Anciano Rey we offer you all of that and much more, respecting the tradition of the most traditional cuisine. In addition, so that you do not miss anything, we leave you this link of Madrid City Council where you can check all the activities scheduled for Easter 2019. And the only thing that remains is to wish you a great stay in our city.